Despite claims to the contrary, John Howard plotted, cajoled, manipulated and lied to bring down the Australian Republic in 1999 — and has now received his due reward from the Queen. Managing editor David Donovan gives the definitive account. LAST NIGHT, John Howard received a shiny silver token from the Queen for “meritorious service to the Crown”. The award, and the subsequent closeness between the pair, comes as no surprise since Howard, as Australian Prime Minister during the lead up to the 1999 Republican referendum, played the pivotal role in preventing Australian from breaking with the British monarchy and becoming a fully and truly independent Republic. The Queen has simply given Howard – after a sufficiently and decorously long period had elapsed – fair payment for services rendered in 1997-1999. This is simply the system of patronage we must expect our local elites to receive from an unelected foreign hereditary monarchy. Some people, including Howard himself, try to claim that it was direct election republicans such as Ted Mack and Phil Cleary who were critical in stopping Australia’s push to become a Republic in the dying days of the last millennium. This is incorrect, they were merely fall guys and stooges — unconsciously acting out the roles set for them. 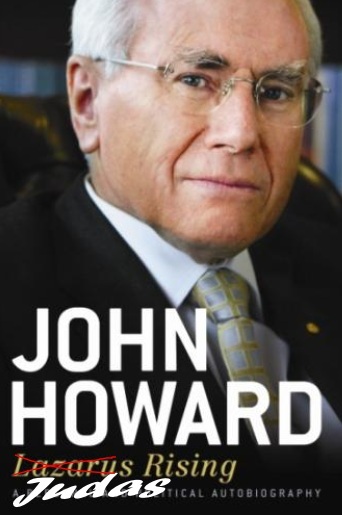 It was, absolutely, without any doubt, Howard who was the primary reason the 1999 referendum failed, even though a clear majority of Australians wanted the nation to become a Republic — as he plotted, cajoled, lied, manipulated, schemed and deceived to bring it down. A close reading of Howard’s uniformly self-glorifying autobiography ‘Lazarus Rising’ reveals the hard work Howard put in to defeat the push for Australia to finally become fully and truly independent of Britain. In the chapter he cringingly entitles “We still want you Ma’am — the Republican debate”, Howard attempts to justify and whitewash his role in the republican defeat but, unfortunately for him, is rather let down by his repetitive, reflexive, gloating. History shows that Howard campaigned long and hard in the lead-up to the 1999 referendum, clogging the media airwaves, as only a sitting Prime Minister can, to talk down the Republic at every possible and conceivable opportunity. This was, without question, a critical factor in the proposal’s defeat. But Howard wasn’t content to simply campaign against the Republic, he also worked assiduously behind the scenes to further stack the deck. Showing obvious bad faith, Howard appointed rabid monarchist Liberal Senator Nick Minchin to organise the 1998 Constitutional Convention. Minchin and Howard then came up with an ingenious plan they hoped would ensure the Convention fixed upon a publicly unpopular republican model that would inevitably split the pro-republic camp. Far from recording the “overwhelming majority” Howard declared, in fact, those voting in favour of the “Bi-Partisan Model” did not even constitute a simple majority of the total delegates at the Convention. There was no consensus, there was in fact a massive rift over the model for a republic at the Convention — and yet Howard repudiated his word without hesitation and offered a referendum on a model that had a bare majority of voting delegates and less than a majority overall. 'Minchin, giving the warm-up address, made … reference to being back at the same venue where a decade before, at the Constitutional Convention, the conservatives suckered the republicans into accepting a dud model that scuppered the republic. There is no question that a model decided upon by the community would have stood a much greater chance of success in a referendum than the always publicly unpopular parliamentary appointment model. Howard lied to the Australian people about giving them a plebiscite if no consensus was achievable; if he had kept his word, we would almost certainly be a republic today. But Howard wasn’t finished there — he still had a few tricks up his sleeve to further minimise the Republican vote. What that means is: if you don’t understand exactly what you are being asked to vote on, the safest course of action is to just vote “No”. It’s an appeal to ignorance. "Do you want Australia to become a Republic, replacing the Queen with an Australian head of state?" "An Act to alter the Constitution to establish the Commonwealth of Australia as a Republic with the Queen and Governor-General being replaced by a President appointed by two thirds majority of the Members of the Commonwealth Parliament." Howard’s argument was that he needed to provide clarity about the question — a fatuous lie, since all the detail necessary had been fully provided in the explanatory material as was quite proper and constitutional under s128 of the Constitution, which merely specifies that the vote shall be taken in "such manner as the Paliament provides". Howard knew a complicated question could sway a vital few per cent. Indeed, exit polls showed many ordinary Australians, perhaps those with low levels of literacy, were suspicious about the wording — with many becoming confused about exactly what they were being asked. 'There was an avalanche of criticism of the first draft. The Labor Party came out wholeheartedly against the proposed preamble, as did Malcolm Turnbull on behalf of the ARM. They thought that a separate debate on a preamble would weaken support for a republic. At one stage it looked as if the preamble would not get through parliament. Of course, there were others who also played a part in denying Australia's Republic, though none played a role as central as Howard's. Much more than merely expressing dissent, as his own autobiography makes clear, Howard plotted with other monarchists, stacked the constitutional convention, fostered divisions amongst republicans, created a confusing question and threw other distractions into the mix. Moreover, he broke promises and lied to the people on numerous occasions to ensure Australia remained under the British monarchy. In his famous speech on the referendum's defeat, Malcolm Turnbull described John Howard as “the Prime Minister who broke a nation’s heart” — and he was. But, at the same time, this self-admitted anglophile royalist made one old British Queen (at least) very, very, happy — for which he received last night somewhat less than the customary 30 pieces of silver.